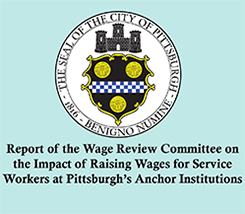 I am Cindy Cromie and I was a UPMC transcriptionist for more than 20 years until UPMC outsourced transcriptionists like me to a low-wage contractor in June. I couldn’t believe it. Without a moment’s notice, UPMC was letting us go. Our work was good, and the need was still there. In fact, they wanted us to continue working for UPMC – just through a contractor. The difference: our paychecks cut in half, at best; our healthcare benefits eliminated. Like others in the transcription department, I took the job with Nuance, the contractor — we were given 10 days to decide to take it or leave it and told we couldn’t get unemployment insurance. From one paycheck to the next, my income in a two-week pay period as an hourly transcriptionist went from $1,012 to $330 – a 67 percent decrease – with Nuance’s pay-by-line system. In fact, Nuance had to adjust my pay to bring it up to minimum wage. Who can afford to live on that? At 57, I had to move in with my mother, back to my childhood home. I had to cancel my son’s health insurance. And I’m dipping into my retirement savings just to cover my bills. I filed for and was granted unemployment benefits, but now, four months down the road, I am facing further indignity by Nuance. The company that UPMC outsourced me and other transcriptionists to is appealing my unemployment claim. All of us former UPMC transcriptionists are hardworking people. We did good work helping to keep patients safe and we earned enough to support our families. 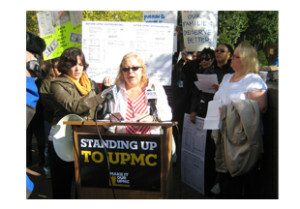 UPMC decided to push me and my co-workers out of the ranks of the middle class and into the ranks of the working poor. Thousands of other workers at UPMC are struggling to get by on UPMC’s poverty jobs. We don’t think that’s charitable behavior. 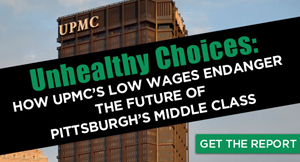 Together, we need to tell UPMC that they cost us all. We need to remind the community what happens when a business chooses profits over people. That’s why we’re all coming together to demand UPMC help build and strengthen our middle class instead of holding our families and economy back. employer, yet this is how they treat the people that work for them.